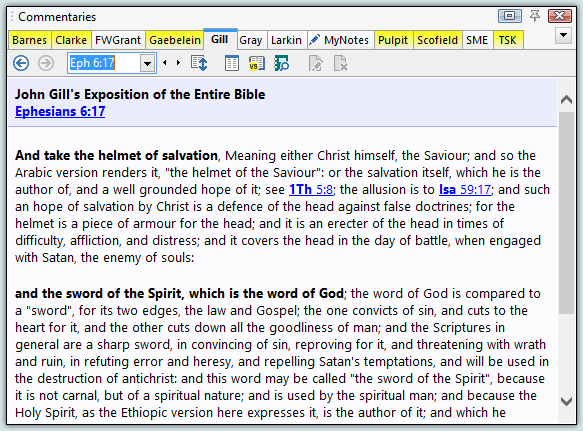 The Commentary Panel gives you easy access to several commentary resources in SwordSearcher. The tabs at the top of the panel make it easy to switch between commentaries without having to fill your display with new windows. The tabs for other commentaries with entries on the same verse are specially colored to make it easy to go straight to related material by different authors. Verse references are linked, and holding the mouse pointer over a verse link will display the text of the verse(s) in a pop-up window. With a single click, you can expand to chapter to view an entire chapter of commentary at once, so you don't have to navigate to each individual entry for the text. You can create your own commentaries to record your verse-by-verse thoughts, and any Scripture references you type are automatically linked.